As more and more educators consider using games in their learning programs, they must understand all of the nuances involved. Today, the buzzwords in education are gamification, play-based learning, gaming, game-based learning, and digital game-based learning. There are some popular misconceptions about these terms. This post will set the record straight and give potential game-based learning facilitators helpful definitions for the terminology they may encounter. What follows next is some clarifying explanations to help refine meaning and eliminate some of these frequent misconceptions. Learning philosophies and educational theories such as Jean Piaget, Erik Erikson, and Lev Vygotsky all recognize the value of children using play for self-teaching and its important role in a child’s cognitive development. As parents and educators, we must provide our kids with more opportunities to play. After all, George Dorsey said it best, “Play is the beginning of knowledge”. Challenge — the problem or scenario presented to the player to overcome. Rules — the structures, boundaries or freedoms provided to players during gameplay. Interactivity — the actions or processes players undergo during gameplay. Feedback — the reaction of player interaction. Feedback can provide rewards for successful gameplay or consequences for mistakes. Conflict — the in-game challenge, friction, or opposition between players, the game system, or rules. Goals / Outcomes – Goals represent the player’s end desired result. Outcomes represent the end results such as a win, lose or draw. The quick and dirty definition of game-based learning is simply learning through the use of games, both digital and non-digital. Players learn or review academic content during gameplay. For example, Food Truck (pictured below). Food Truck is a phonics game from Aqua, where students practice “chopping” blends, ending sounds (rimes), and whole words into beginning sounds (onsets), ending sounds, and individual letters to create orders for their hungry goblin customers. Game-based learning promotes a student-centered approach to instruction. This approach allows teachers to step out of the spotlight and become learning guides rather than the source of all information in the classroom. Many students today would rather not be lectured to, or receive information from a single source. Rather, they prefer to generate their own knowledge from the readily available resources (digital and human) around them. Gamification (or what Jane McGonigal often referred to as gameful design) is an emerging field of practice that involves the use of game design and mechanics into non-gaming situations. We experience gamified situations like this daily. Have you ever played the MacDonald’s Monopoly game? Is buying a burger or milkshake a game? No, but creating a system-based mental construct that entices players to buy more food for the opportunity to win a million dollars sounds much more appealing. Do you belong to the Starbuck’s Rewards program — a program that gives you a stamp for every Soy-based Latte you buy? How does this reward you? It provides the consumer with a free drink after so many purchased drinks. Both of these consumer programs are popular examples of gamification. Have you ever created a bracket for March Madness? Or raced a spouse to finish cleaning the house or running errands? Or read a story-based book to that asked you to make a decision amongst a few choices? For example, should you visit the wizard, follow the path to the left, or cross the river? Creating a compelling storyline or narrative — Powerful stories draw us in. When used in the classroom, gamification becomes a means of immersing students into an engaging narrative. Classroom imagination and storytelling spawn a new and exciting mental construct. Students are transported from their classrooms into a storyline. The content, assignments, assessments, and even the classroom procedures all take on the attributes of the storyline. Autonomy — In a game, players receive a great deal of power to make decisions and succeed or fail by their own choices. Educators must look for ways of placing the powerful decisions in the hands of their learners. Mastery of skills — Games allow players to experience them over and over again to master skills or review content. Repetition is a powerful learning strategy. Immediate feedback — Games provide both positive and negative feedback in a timely manner. This fast-paced response allows the players to adapt quickly and overcome learning challenges. Collaboration — Games promote teamwork and community. The individual needs of the players are replaced by a combined focus on common goals. Competition — The conflict and challenge between individual players or teams. Problem-solving — Games provide problems for the player to solve. The problems cannot be too easy, or the player will lose interest. If the game is too hard, then players will become frustrated and give up. Differentiated learning experiences — Games can progress from easy challenges to harder ones. They can offer the right level of challenge based on the current skillset or ability of the player. 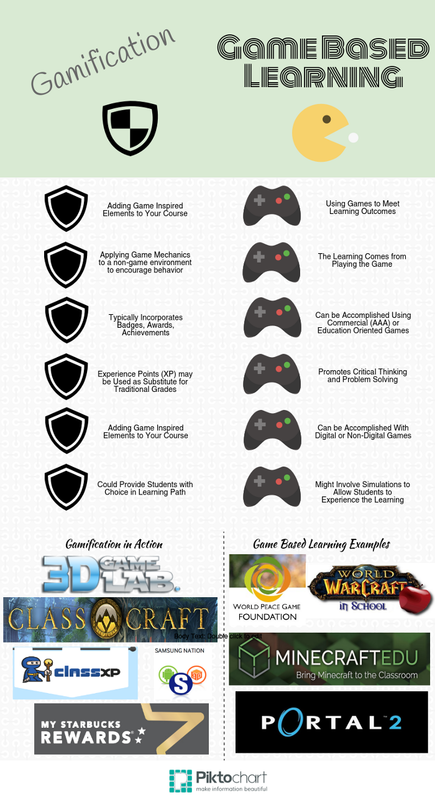 Game-based learning and gamification are not the same. Although each of these strategies has the potential to invigorate learning, game-based learning and gamification are distinctly different approaches to teaching, learning, and assessment. Remember, game-based learning involves the player learning or reviewing content or developing skills as they play a game. Gamification or gameful design involves the use of gaming elements in a non-gaming scenario. This graphic, provided by my friend Steve Isaacs, summarizes of differences between the two terms. Of course, it is always up to how the educator is using the game or bits of a game in the context of learning to truly make the distinction between both strategies. Bruce, T. (2011) Cultivating Creativity: for babies, Toddlers and Young Children. London: Hodder. Prensky, M. (2007). Digital game-based learning. St. Paul, Minn.: Paragon House 5-11. Schaaf, R. & Mohan, N. (2016). Game on: Using digital games for 21st century teaching, learning, and assessment. Bloomington, IN: Solution Tree Press. A special thank you to Steve Isaacs (@mr_isaacs) for the use of the infographic!